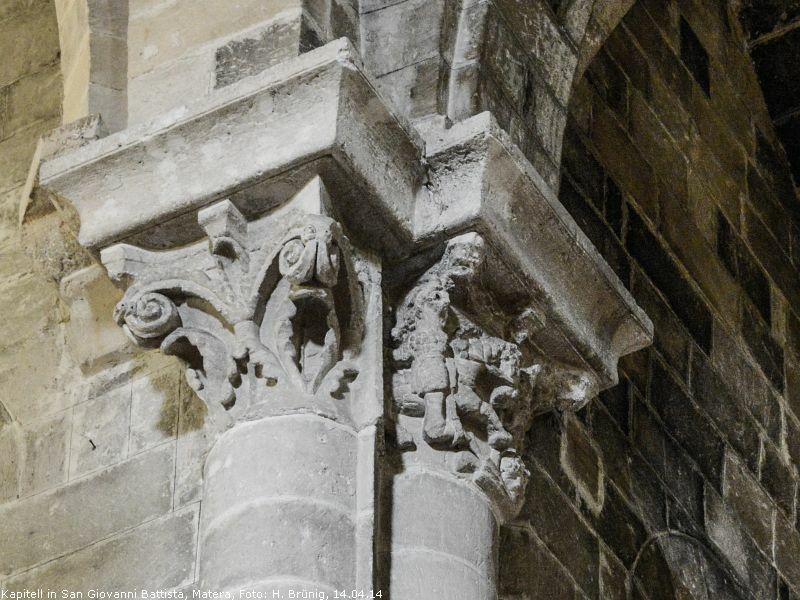 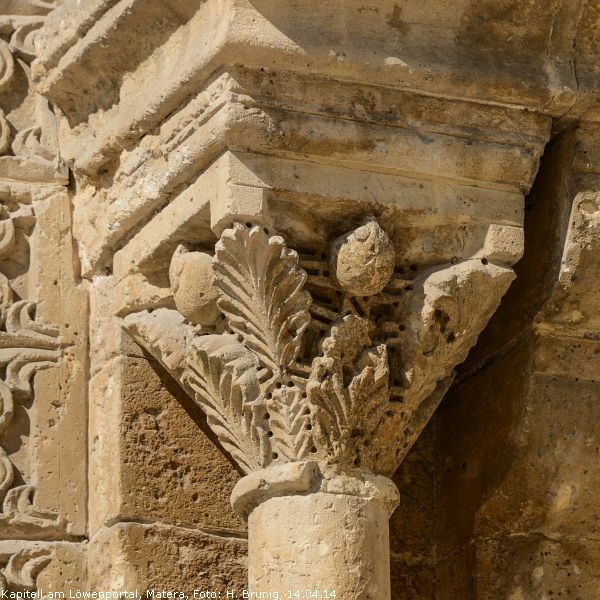 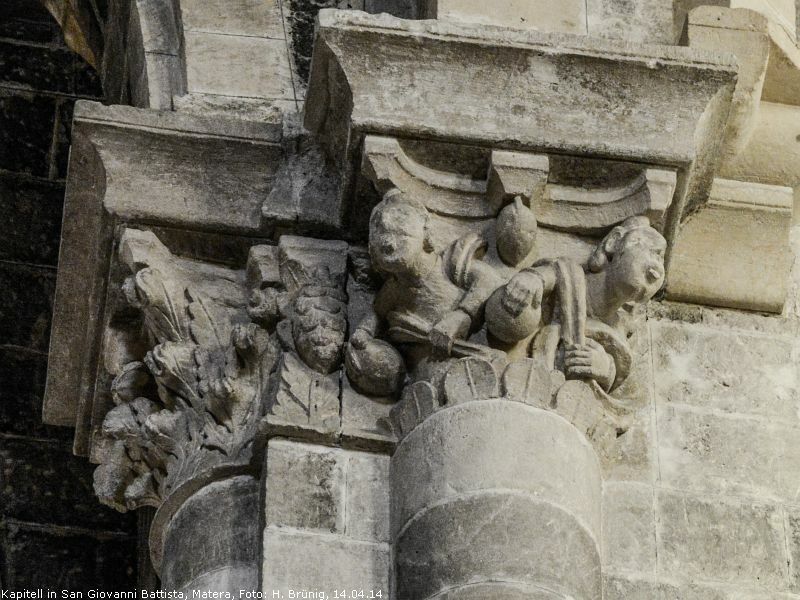 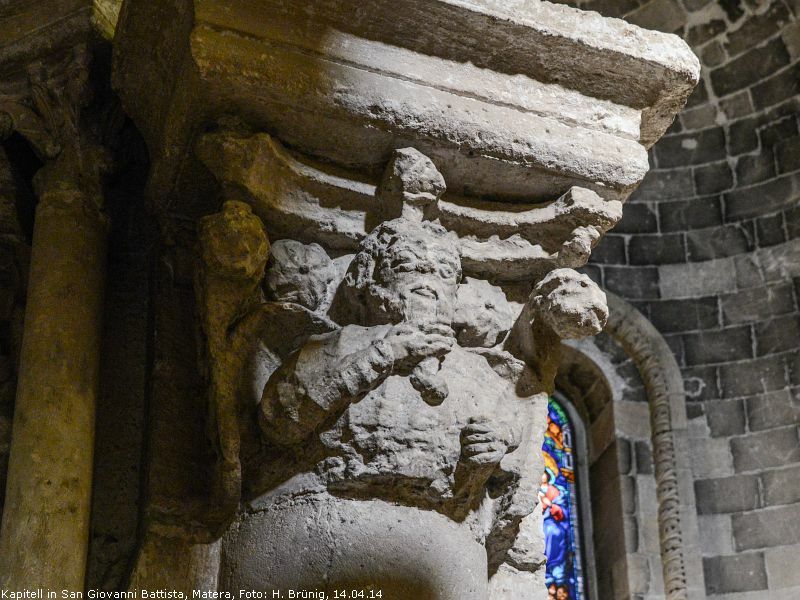 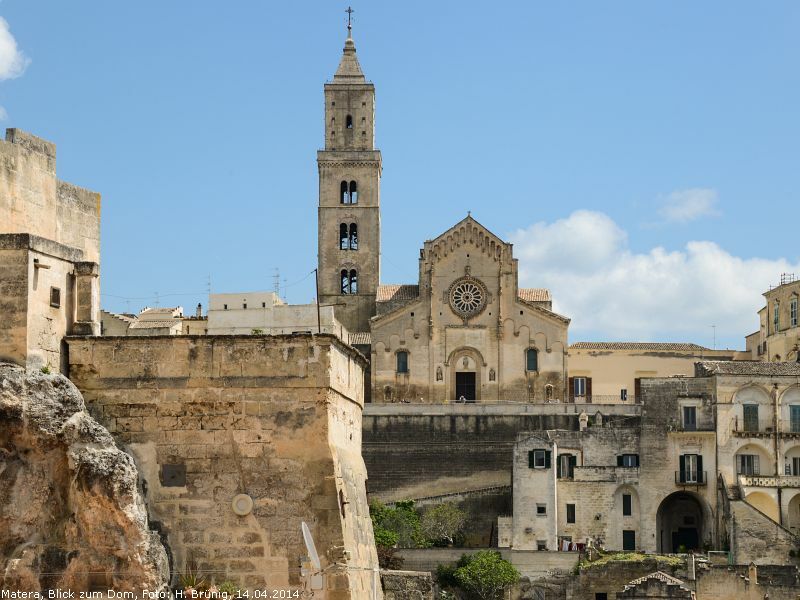 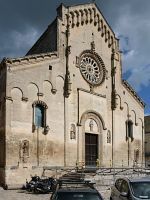 Von 1230 bis 1270 errichtet, präsentiert sich die Kathedrale in Matera auf der hochgelegenen Piazza Duomo, dem Domplatz, klar strukturiert im romanisch-apulischen Stil. 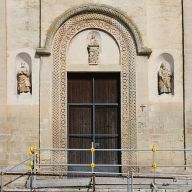 Die Hauptfassade wird von der großen sechzehnstrahligen Fensterrose beherrscht, es scheint, als ob sie von den drei Gestalten (unten und seitlich) gehalten und vielleicht sogar gedreht wird. 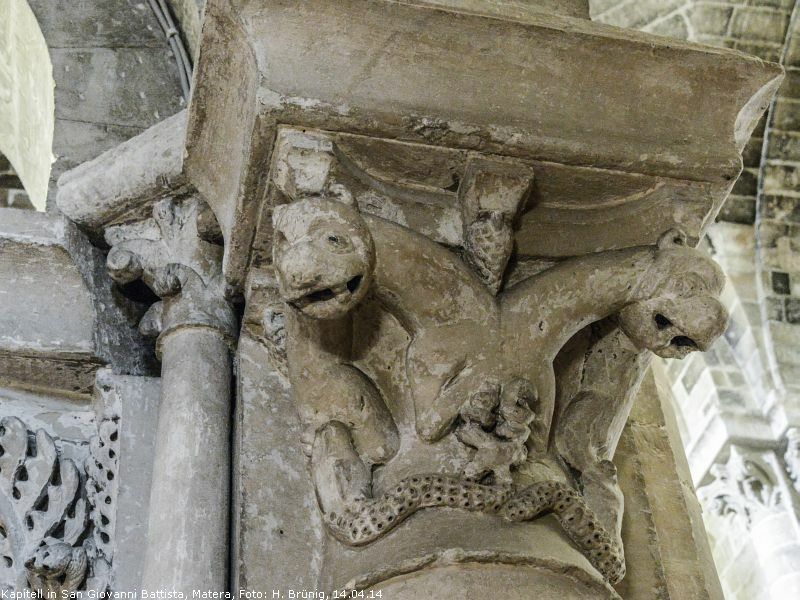 Oben befindet sich der Erzengel Michael, der auf dem besiegten Drachen steht. 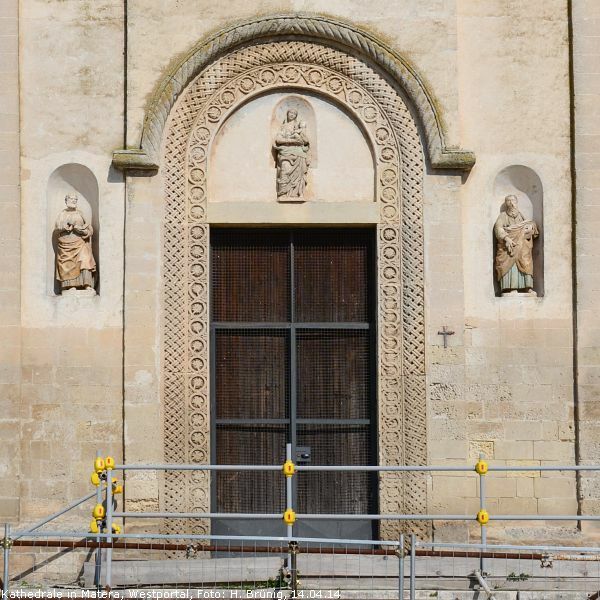 Die Fassade wird durch Lisenen, Säulen und Blendbögen vertikal gegliedert. 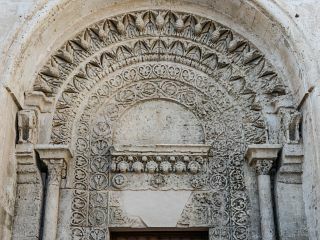 Bögen mit Planzenornamenten und Flechtwerk schmücken das Portal. 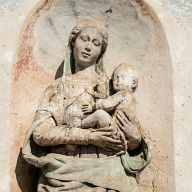 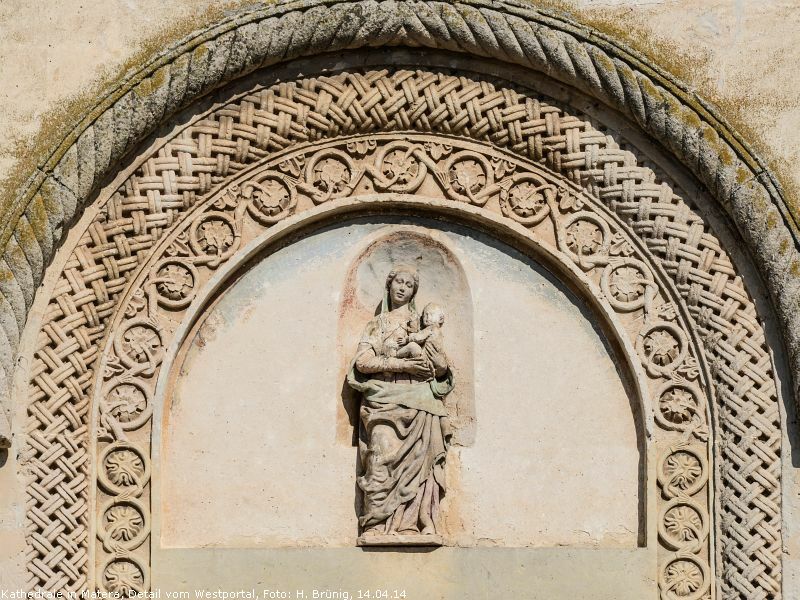 Im Feld über dem Türsturz befindet sich eine Marienfigur mit dem Jesuskind - schließlich ist die Kathedrale der Madonna geweiht, der Zusatz "Bruna" bedeutet soviel wie "Schutz". Zwei weitere Portale und ein reich geschmücktes Fenster befinden sich an der Südseite zur Piazza Duomo, diese Seitenfassade ist mit ihrem Beiwerk (Lisenen und Blendbögen) eindeutig als Schauseite ausgebildet. Besonders das Löwenportal verdient Beachtung, wenn auch die Löwen durch den Zahn der Zeit ziemlich gelitten haben. 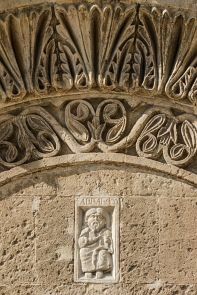 Mehrere Stufen führen zum Portal, die Löwen stehen erhöht auf Postamenten und halten Menschenfiguren in ihren Klauen. 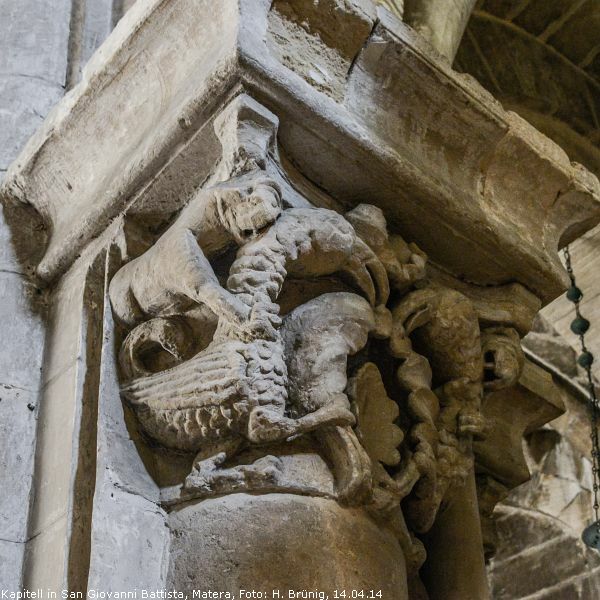 Die Löwen tragen auf ihren Rücken Säulen mit Kapitellen, die in gleicher Höhe mit seitlichen Konsolen abschließen, von denen dann der rahmende Baldachin ausgeht. 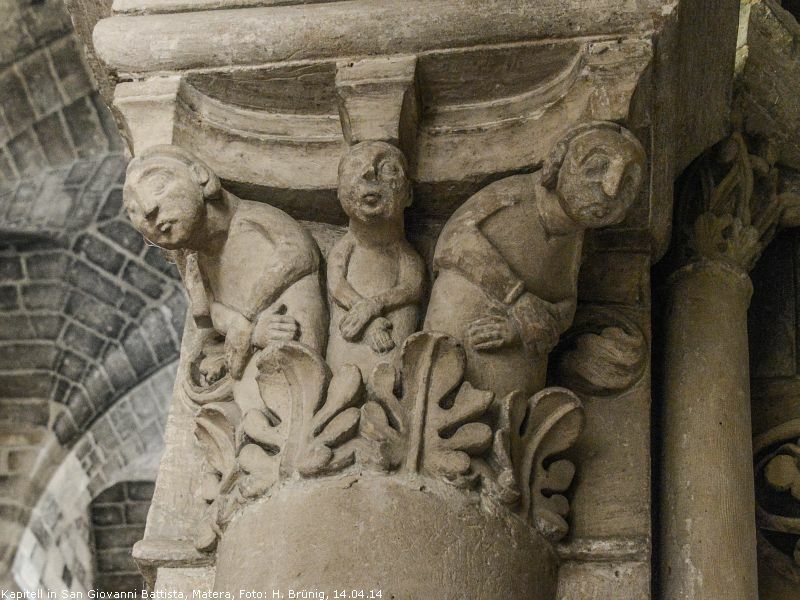 Die Portaleinfassung sowie die Baldachinbögen sind aufwendig verziert, leider fehlen den Greifen oben auf den Konsolen die Köpfe. 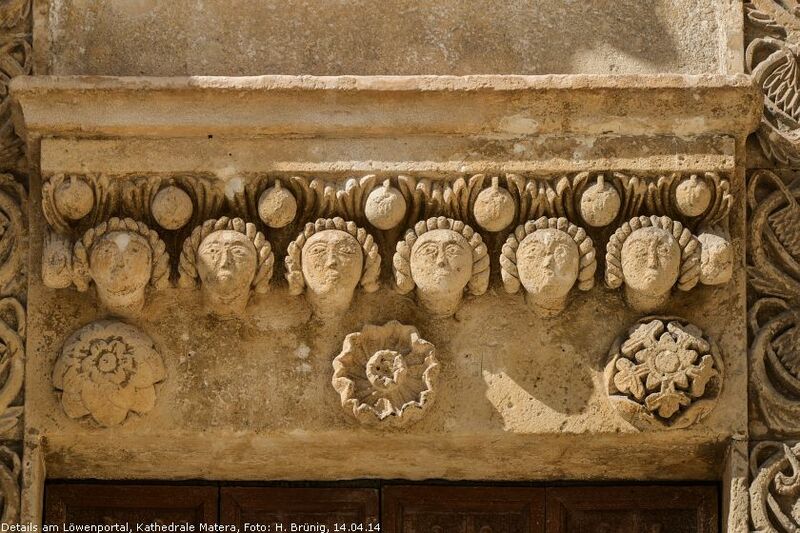 Den Türsturz zieren menschliche Köpfe und Blumen, das Tympanonfeld ist leer. 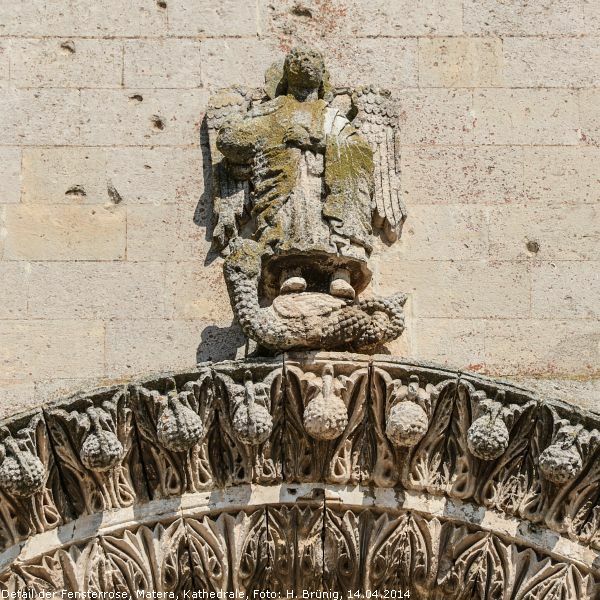 Statt dessen wird das dreieckige Giebelfeld über dem Portal noch einmal betont: Über einem (etwas verkniffenen) Gesicht erhebt sich eine Säule mit Konsole und kopflosem Adler (?) 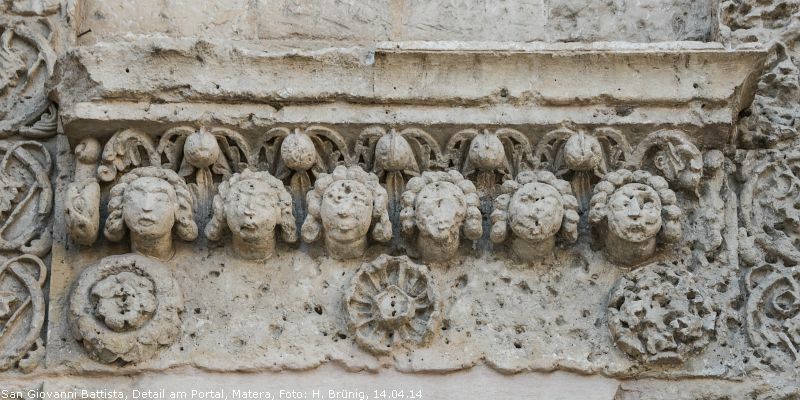 mit Beutetier (?). 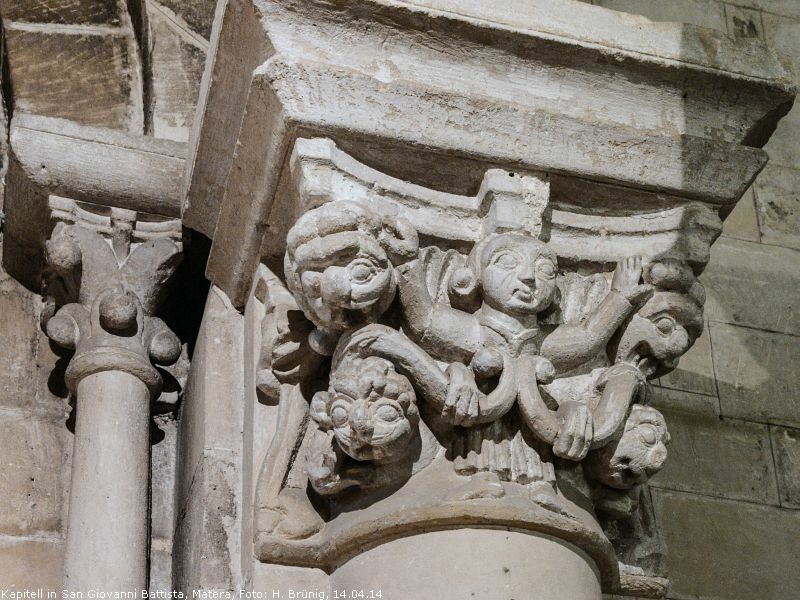 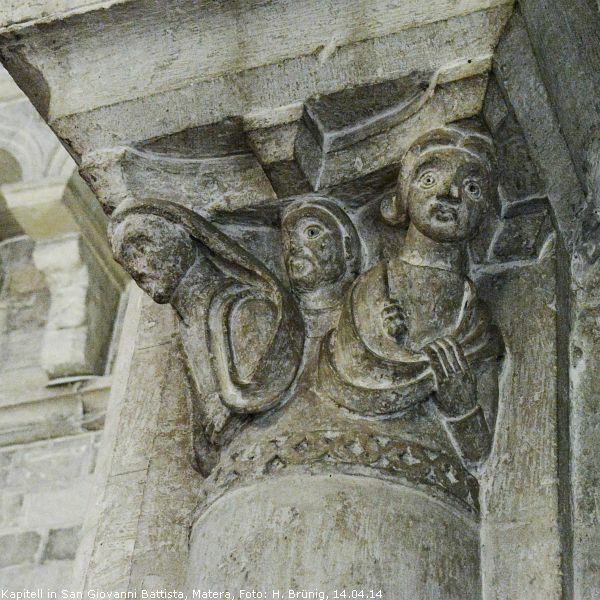 Weiter vorn an der Südseite der Kathedrale befindet sich ein Portal, zu dem ebenfalls mehrere Stufen führen. 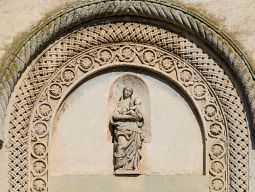 Das Portal ist aufwändig mit ornamentalen Mustern eingefasst, auf zwei Konsolen sitzen zwei männliche Figuren (Mönche? 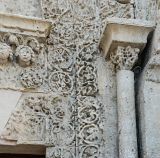 ), der rechte hält ein geöffnetes Buch in den Händen. Den Türsturz schmückt eine kleine steinerne Rose. 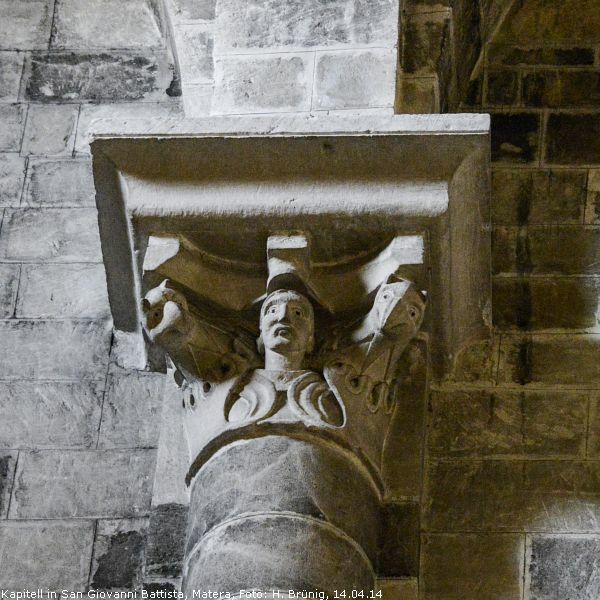 Bei genauem Hinsehen entdeckt man über der Figur im Tympanon den Namen Abraham, wahrscheinlich ist es der Auftraggeber des Baues, der Bischof oder der Baumeister (Eckehart Rotter). 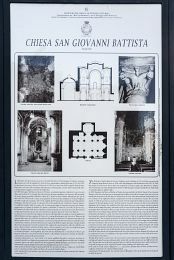 In der Via San Biagio, die einst die Stadtgrenze von Matera darstellte, befindet sich die Kirche San Giovanni Battista. Hier weitet sich die Straße zu einem kleinen Platz und die Kirche präsentiert ihre Südseite als Schauseite, an der sich auch das Eingangsportal befindet. 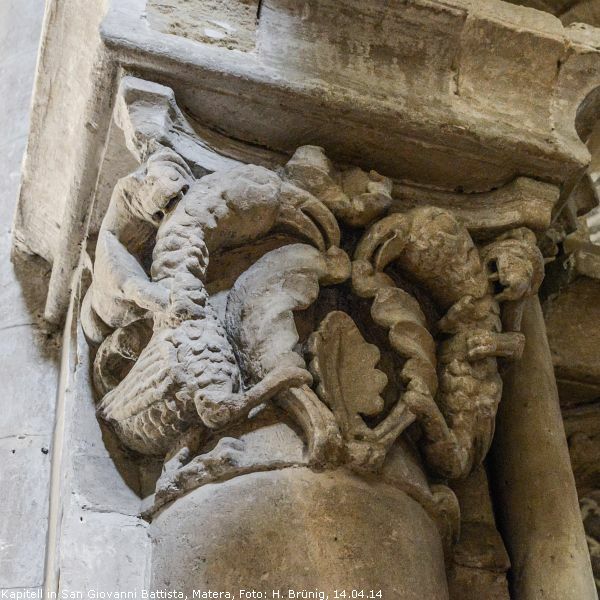 Zwei schlanke Säulen rahmen das Portal ein. 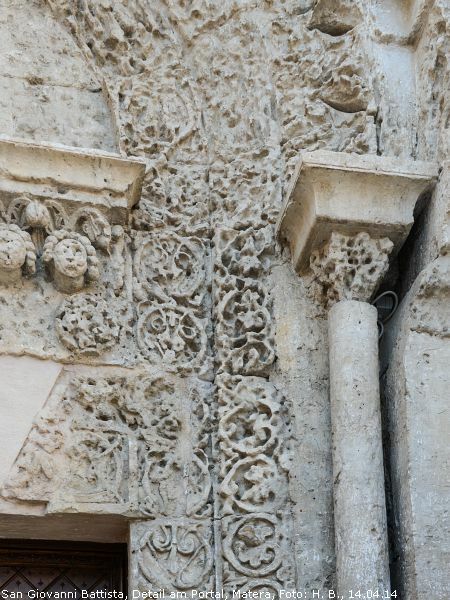 Aufwändig und fein sind die floralen Ornamente gearbeitet, leider sind sie inzwischen teilweise verwittert. 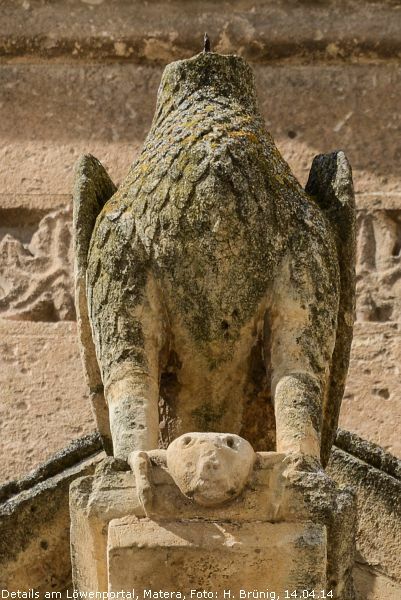 Die Löwen auf den Konsolen links und rechts sind ebenfalls beschädigt. 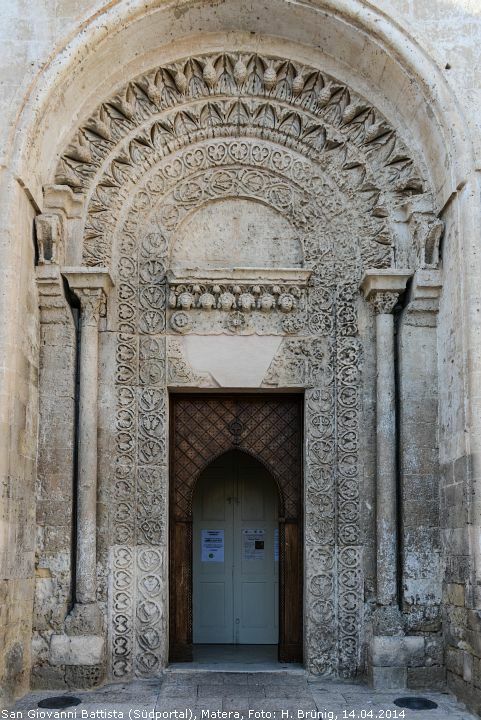 Die Zier des Türsturzes erinnert stark an das Löwenportal der Kathedrale. 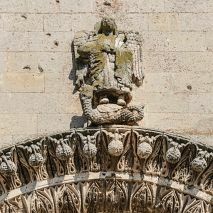 In der (barocken) Ädikula über dem Portal besfindet sich die Statue Johannes des Täufers. 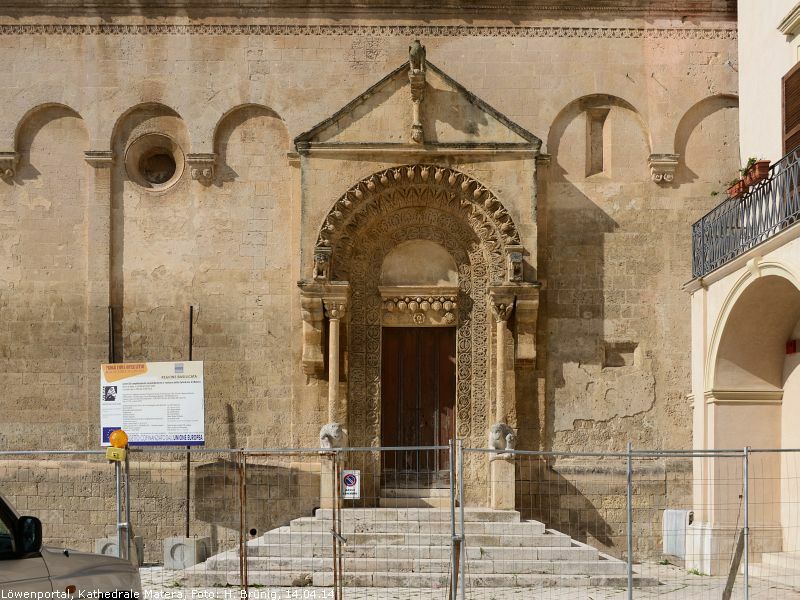 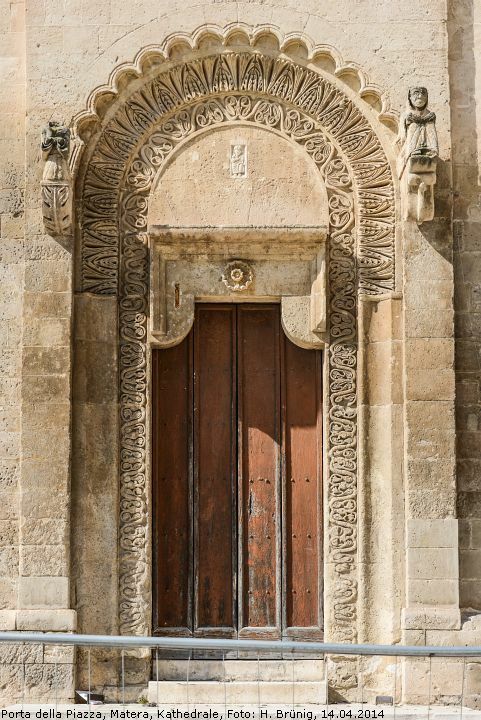 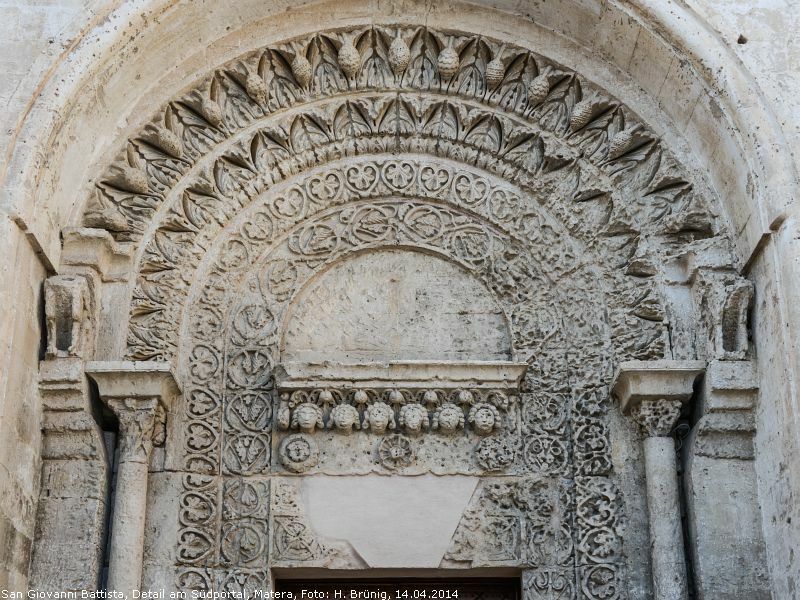 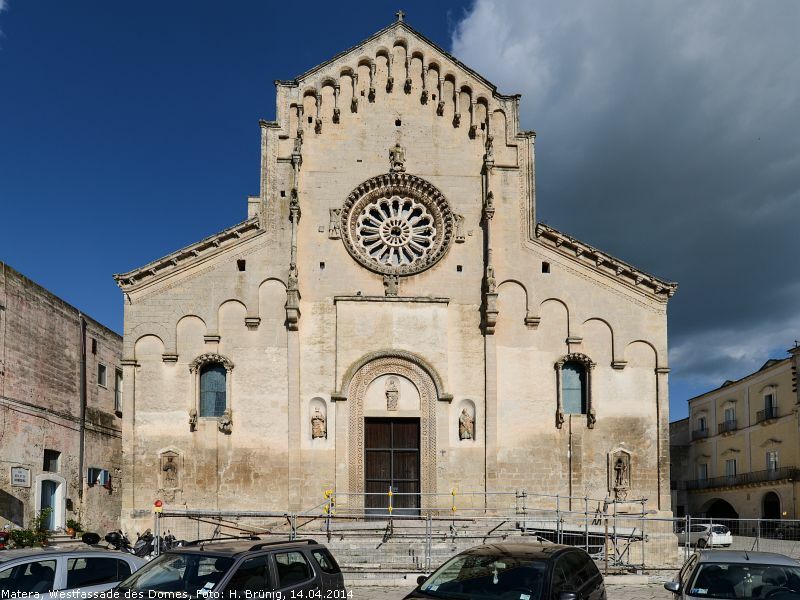 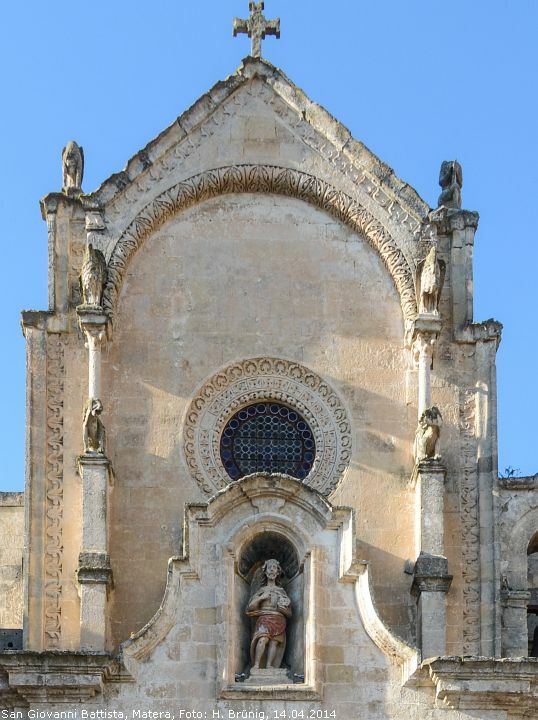 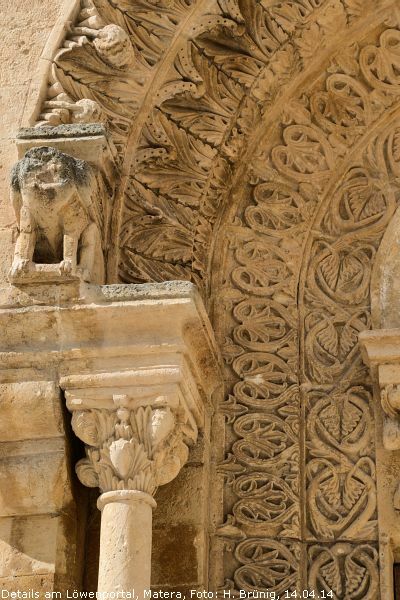 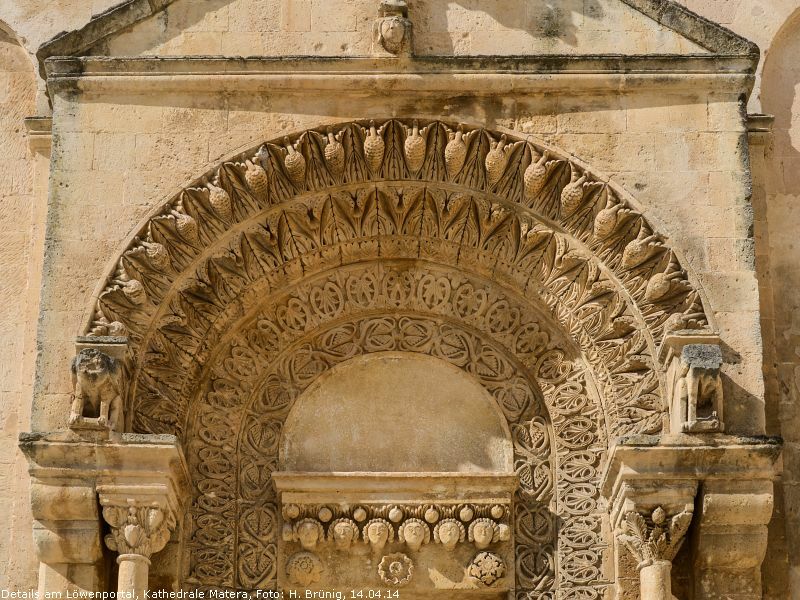 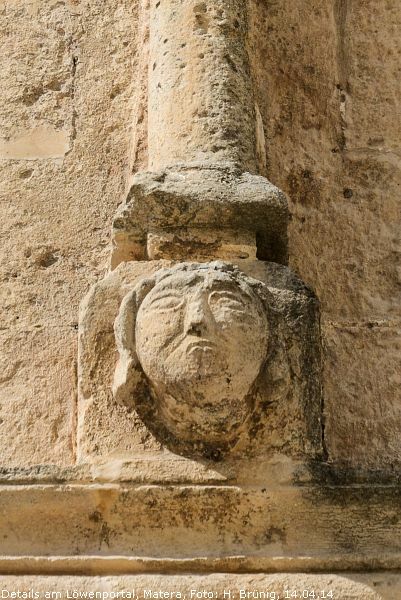 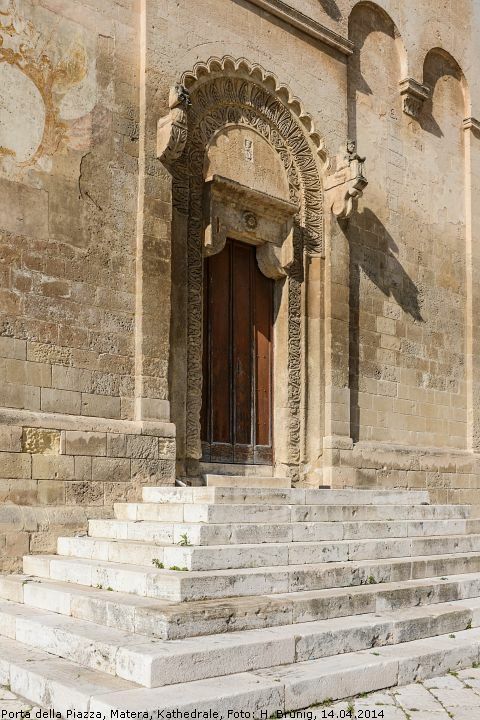 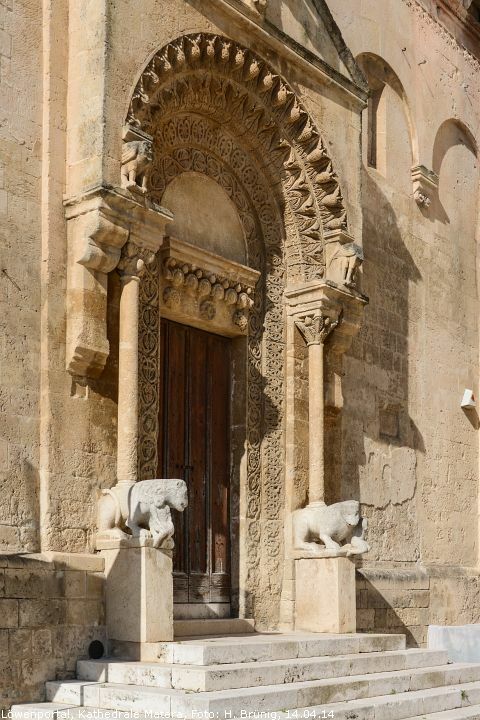 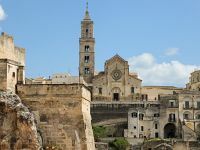 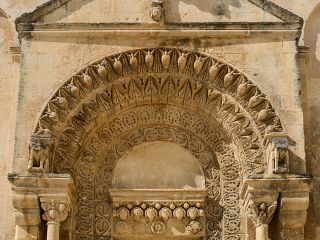 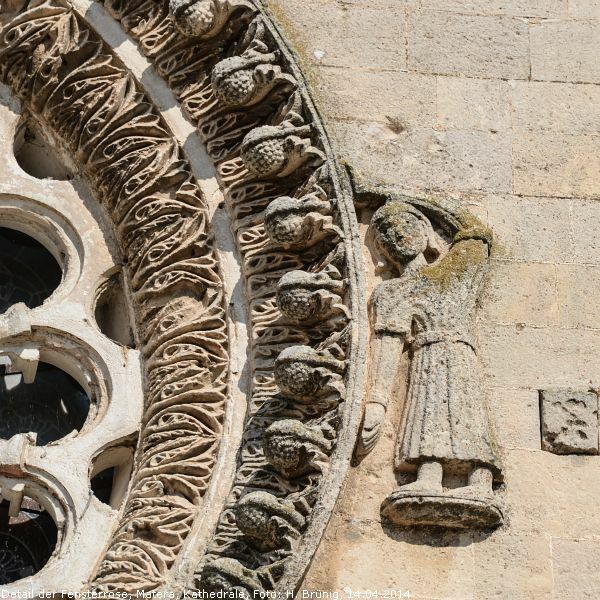 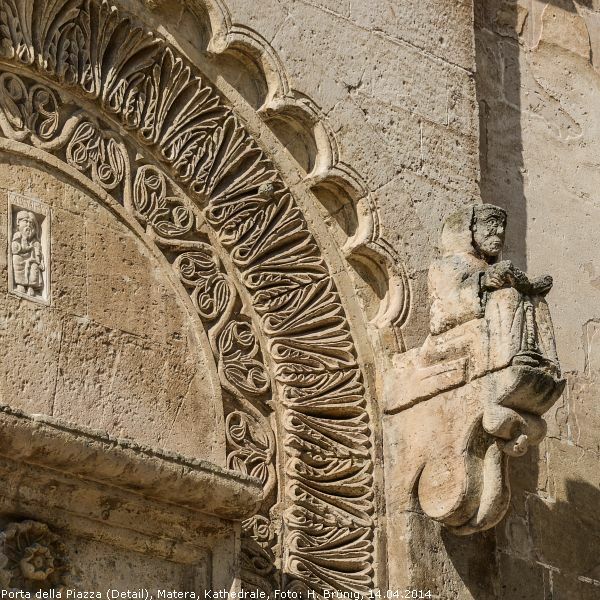 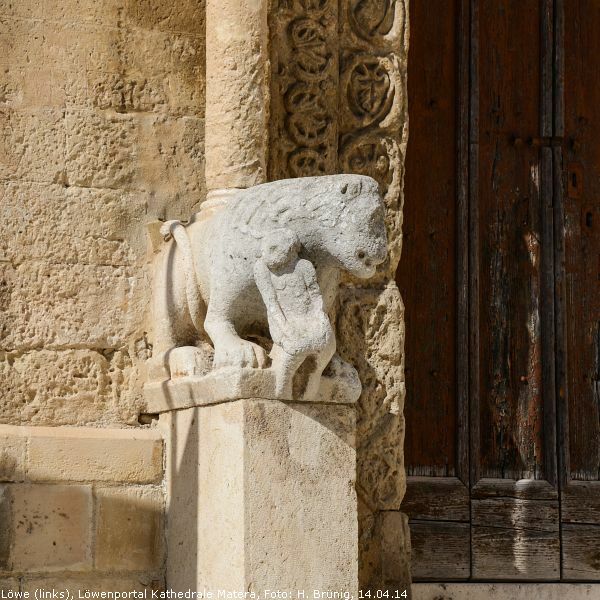 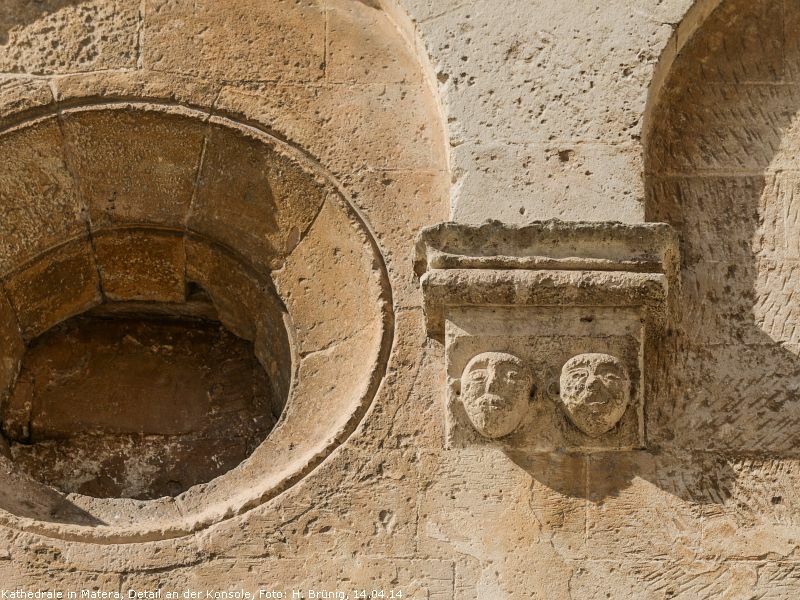 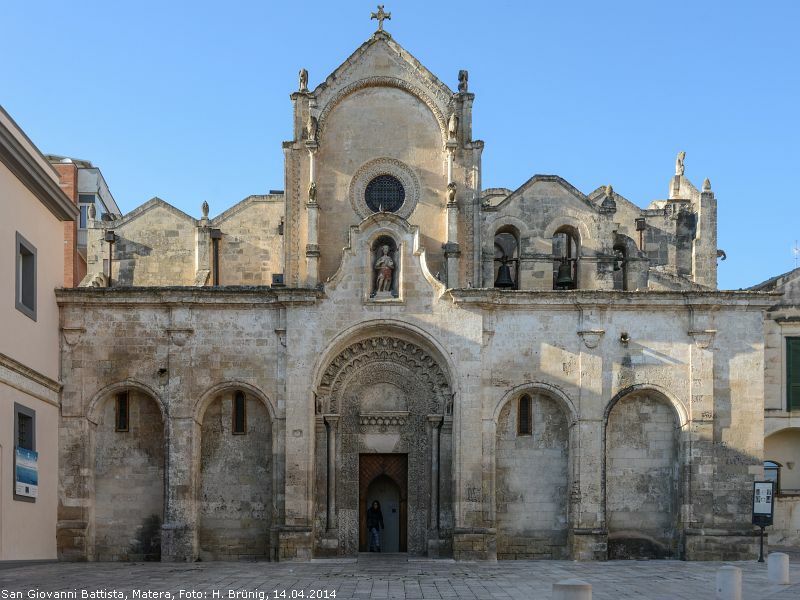 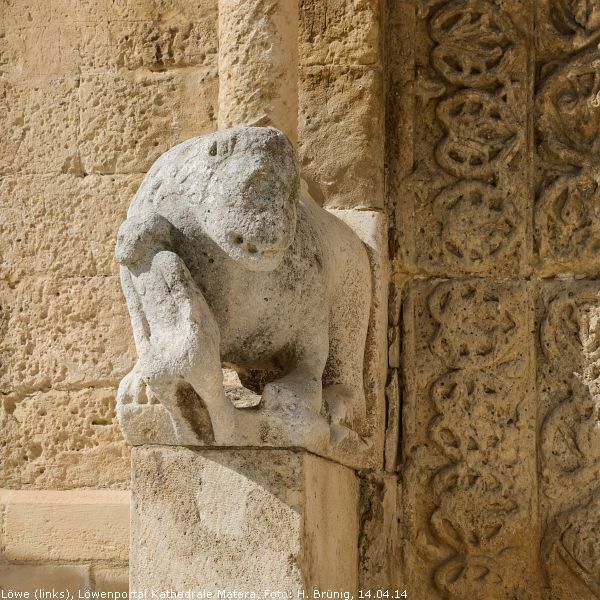 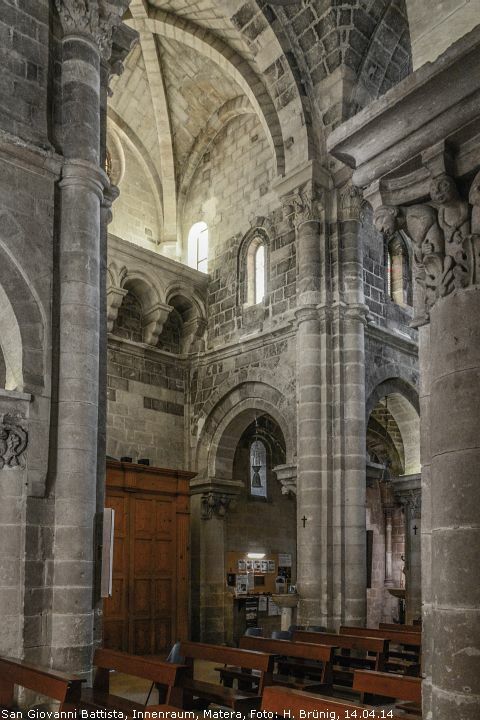 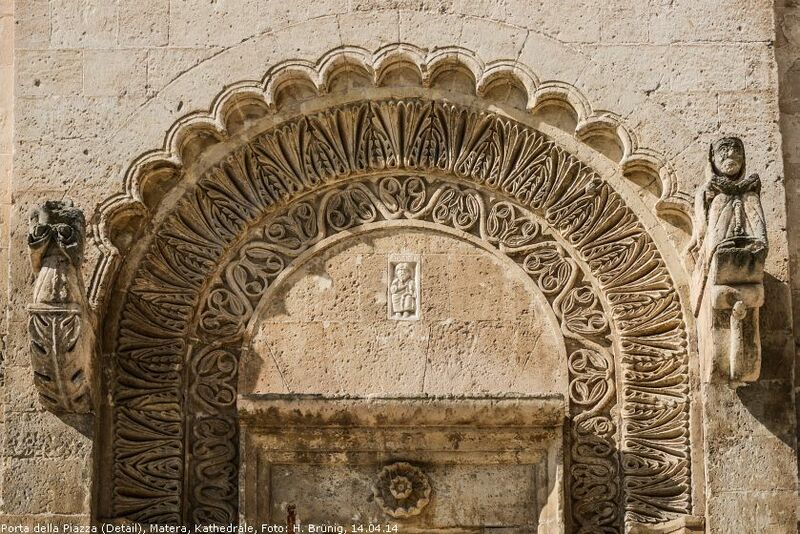 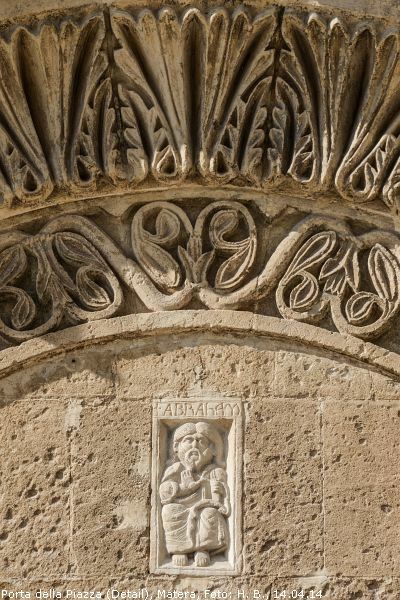 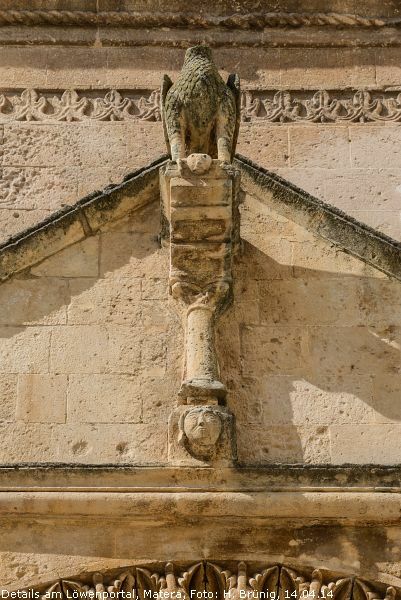 The Penitents of Santa Maria di Accon in Palestine came to Matera in 1215 and they were given the Chapel of Santa Maria la Nova in 1220, which had belonged to the Benedictines until 1212. 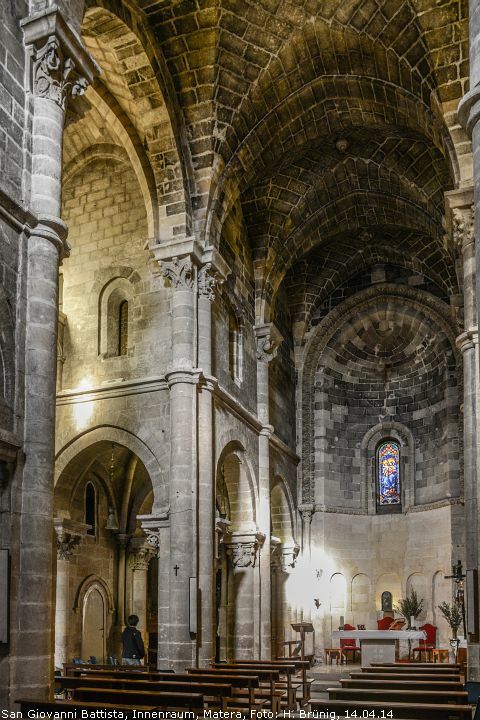 In 1229, they begin to build a new church that was completed in 1236, to replace the Benedictine Chapel. 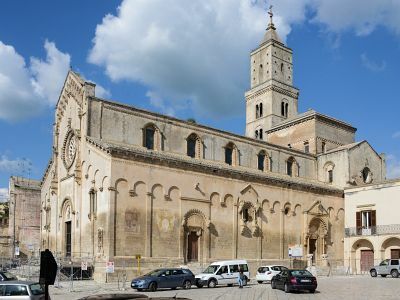 Two centuries later, the nuns abandoned the church in 1480, because its location outside the city walls made it constantly subject to soldiers' raids. In 1695, Monsignor del Ryos, archbishop of Matera, having noted that the Parish Church of San Giovanni Battista in the Sasso Barisano was in extremly bad condition and with the consent of the nuns of Accon, transferred this parish to the old church of Santa Maria la Nova, which had remained abandoned for over two centuries. 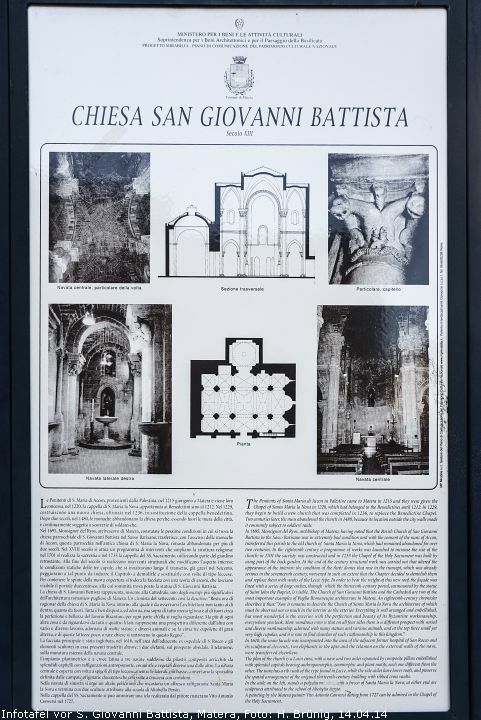 In the eighteenth century a programm of works was launched to increase the size of the church: in 1701 the sacristy was constructed and in 1735 the Chapel of the Holy Sacrament was built by using part of the back garden. 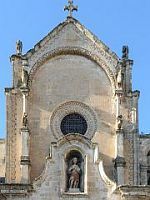 At the end of the century structural work was carried out that altered the appearence of the interior: the condition of three domes that rose in the transept, which was already serious in the seventeenth century, worsened to such an extend that the Chapter decided to demolish them and replace them with vaults of the Lecce type. 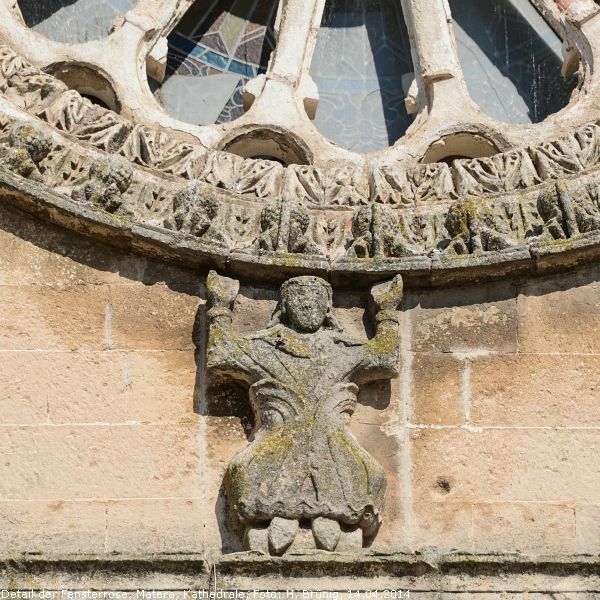 In order to bear the weight of this new roof, the facade was lined with a series of large arches, through which the thirteenth-century portal, surmounted by the statue of Saint John the Baptist, is visible. 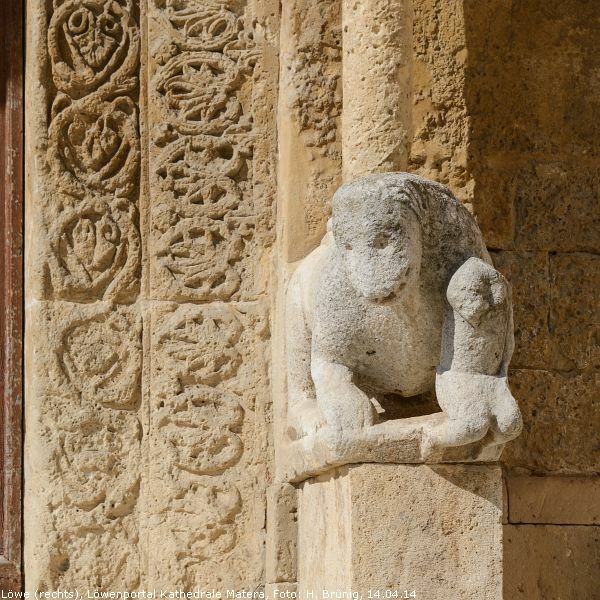 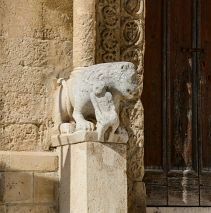 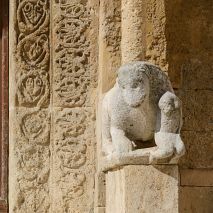 The Curch of San Giovanni Battista and the Cathedral are two of the most important examples of Puglia Romanesque architecture in Matera. 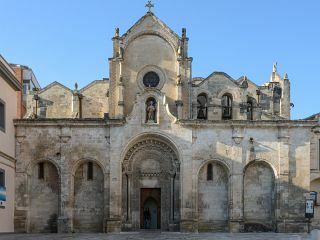 An eighteenth-century chronicler describes it thus: "Now it remains to describe the Church of Santa Maria la Nova the architecture of which must be observed not so much in the interior as the exterior. 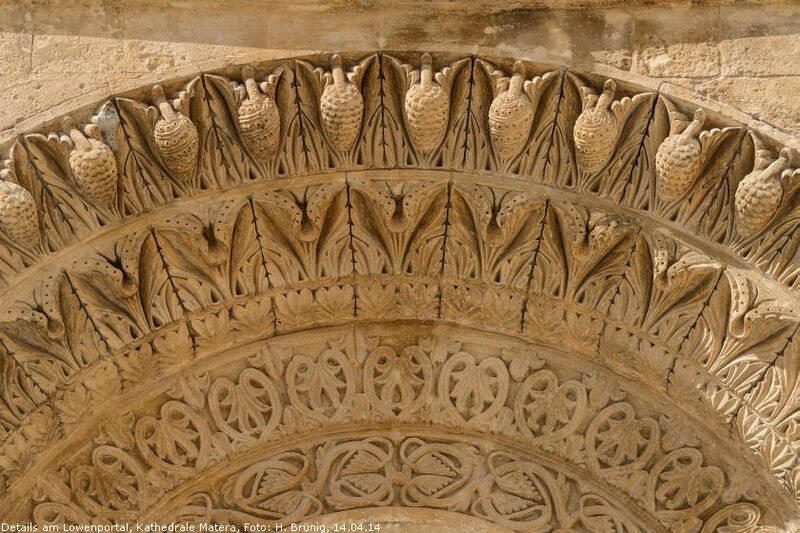 Everything is well arranged and embellished, but most wonderful is the exterior with the perfection and beauty of its Byzantine workmanship, everywhere you look. 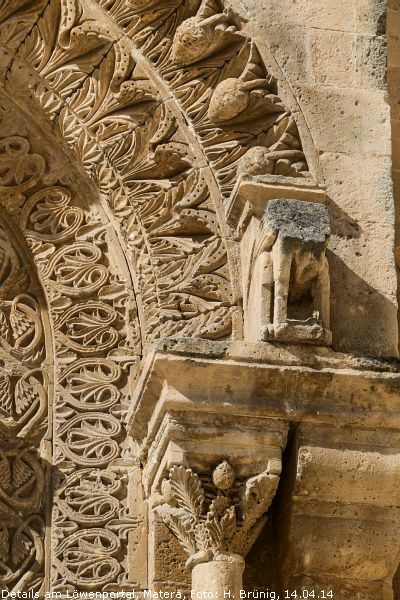 More wondrous even is that on all four sides there is a different prospect with varied and diverse workmanship, adorned with many statues and various animals, and at the top three small yet very high cupolas, and it is rare to find churches of such craftsmanship in this kingdom." 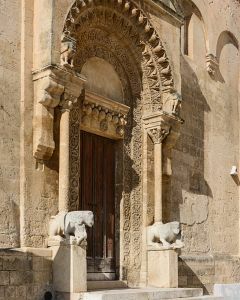 In 1610, the main facade was incorporated into the area of the adjacent former hospital of San Rocco and its sculptural elements, two elephants in the apse and the telamon on the external walls of the nave, were transferred elsewhere. The plan of the church is a Latin cross, with a nave and two aisle separated by composite pillars embellished with splendid capitals bearing anthropomorphic, zoomorphic and plant motifs, each one different from the other. 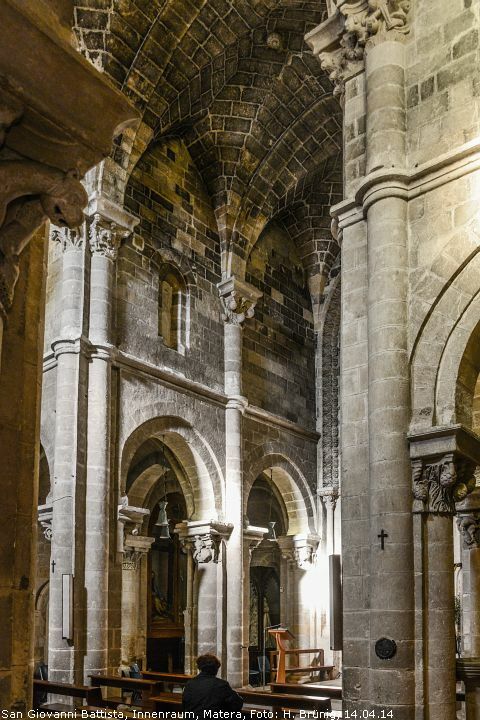 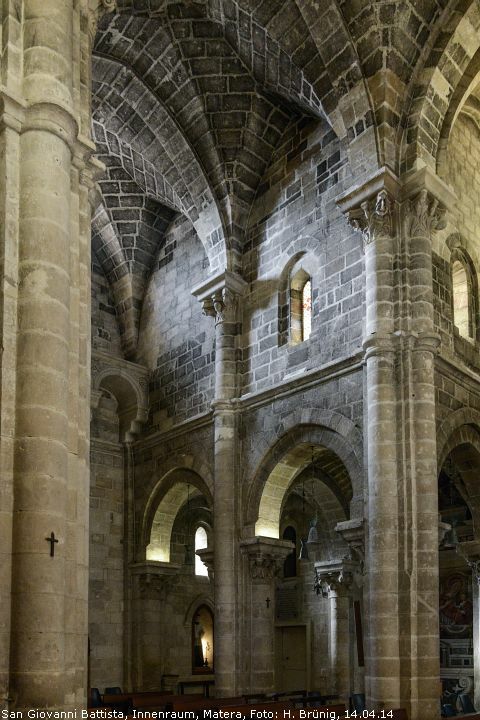 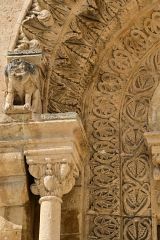 The nave has a rib vault of the type found in Lecce, while the side aisles have lower roofs, and preserve the spatial arrangement of the original thirteenth-century building with ribbed cross vaults. 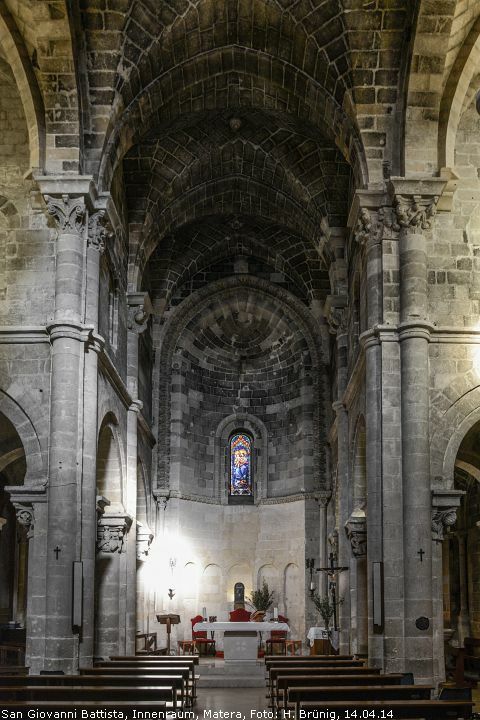 In the aisle on the left, stands a polychrome altar with a fresco of Santa Maria la Nova; at either end are sculptures attributed to the school of Altobello Persio. 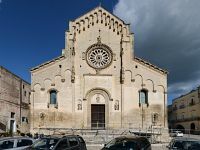 A painting by the Matera painter Vito Antonio Conversi dating from 1727 can be admired in the Chapel of the Holy Sacrament."